Roland DGA is rolling out a fantastic new campaign with a futuristic theme that is sure to catch the attention of upcoming show attendees. 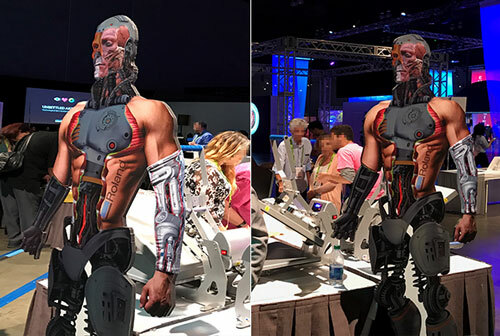 The theme features life-size cyborg cutouts positioned around their booth to engage attendees. Roland needed an excellent foam core board that was extremely rigid and rendered excellent print results; as well as providing the durability that could withstand extreme shipping and display durability for multi-use indoor display environments. UltraBoard was and excellent selection and has provided fantastic results. See for yourself! UltraBoard utilized for Roland DGA trade show displays. 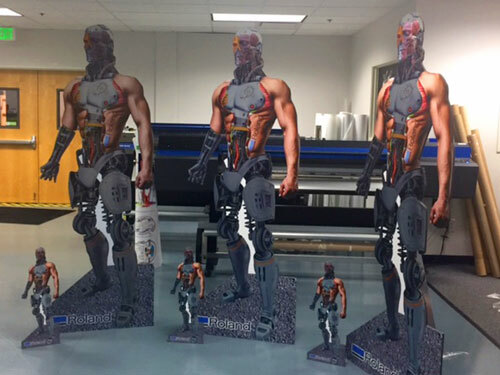 If you would like to learn more about UltraBoard products that are ideal for rigid displays or cutouts, simply click the link below to experience our full product line. This entry was posted in Commercial Signage, Digital Printing, Industry News, Large Format Printing, Retail Signage, Sign Business, Substrates, Tradeshows and tagged large format signage, rigid displays, roland, rolanddga, tradeshows, ultraboard.